Acute macular degeneration is the leading cause of blindness in people over age 55, and in Western countries. The macula is part of the retina, and allows central vision. 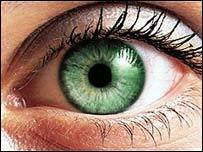 If you smoke, have had previous cataract surgery, or have a family history of AMD, your risk is high. If you are overweight or obese, have heart disease or high blood pressure, ditto. But it’s one of the conditions that is preventable with what you eat, and may actually be improved with nutrition. In fact, the commonly prescribed medications Visivite and Ocuvite (excellent comparison chart here) are formulations of dietary supplements that work for preventing AMD progression. In this Harvard nurses’ study of over 38000 women (average age 54) without AMD, eating at least 1 serving of fish versus eating 1 serving per month lowered risk by 40%. The fish eaten? mostly canned tuna fish and dark-meat fish. I have the chance to speak with ophthamologists and other clinicians soon about nutrition and the eye, and I’ve started to do some research. There’s a treasure trove of information about what you can eat to prevent and treat eye disease–glaucoma, retinopathy (glycemic levels predict), AMD. You just have to look, hard, at what’s there. And taste it too: they’re going to serve my recipe for kale chips for glaucoma prevention!